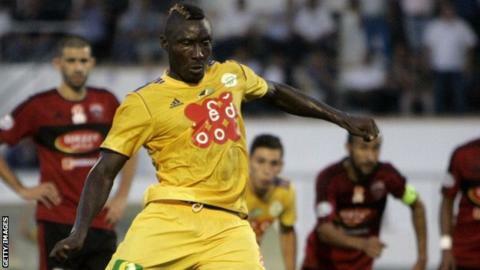 The Confederation of African Football has called for "exemplary sanctions" following the death of JS Kabylie striker Albert Ebosse. The Cameroonian died in hospital after being hit by a stone thrown from the crowd in an Algerian league match. "African football cannot be the breeding ground for hooliganism," said Caf president Issa Hayatou. He added: "We expect exemplary sanctions to be taken against this grave act of violence." Ebosee, 24, was struck on the head by the stone apparently thrown from a section of his club's own fans as the players left the field. He had scored Kabylie's only goal in the 2-1 defeat to USM Alger in Tizi Ouzou. Algerian authorities have ordered the indefinite closure of the 1st November 1954 stadium. JS Kabylie confirmed in a statement posted on the club's website that he had passed away in hospital later on Saturday, although they did not confirm the exact cause of death. "My thoughts go out to the family and friends of this young man who enjoyed his job peacefully and went further to pursue his passion for football abroad," added Hayatou in a statement on Sunday. "Violence has no place in African football in particular and sports in general. "We remain resolute and state in the strongest terms our determination to eradicate all forms of violence and unsportsmanlike conduct in stadiums on the continent." Ebosse was the leading scorer in the Algerian league in the 2013-14 season with 17 goals, having played the previous season in Malaysia. Algerian League president Mahfoud Kerbadj, who was present at the game, called the death a "catastrophe for national football". "Something unfortunate cost the life of a young player who, in the space of one season, won the hearts of thousands of Algerians in all stadiums in Algeria," Kerbadj said.